Nick Kyrgios is back with a bang! The Australian tennis star played his first match in two months, defeating Germany’s Maximilian Marterer 6-4 4-6 6-3 in first round of Mercedes Cup in Stuttgart on Thursday. 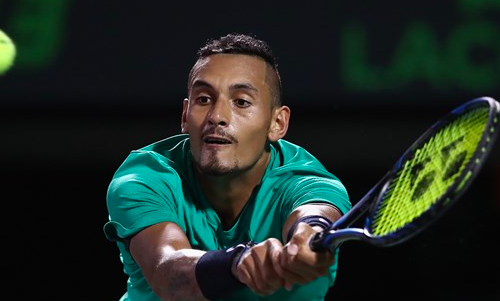 Kyrgios, who had been recently struggling with an elbow injury, pulled off a decent win, given the fact that Marterer reached the fourth round of the French Open before losing to eventual champion Rafael Nadal in straight sets. As if a win was not enough, Kyrgios caught more attention with a cheeky tweener during the sixth game of the third set. And he, too, was impressed with his reflexive winner as he took to his official Instagram account to share a video of it. “I guess it’s good to be back #Tweeners,” he wrote the caption. Kyrgios will look to carry the momentum in the second round when he meets Feliciano Lopez of Spain on Friday for a place in the quarter-finals. Elsewhere at the tournament, Benoit Paire had his tweener game on point as well but went on to lose 6-7 4-6 to Tomas Berdych.